Last month, I shared with you a simple forward and back exercise to help your horse produce beautiful lengthenings. This month, I’ll introduce cavalletti exercises that will further build the engagement, power suppleness and swing in his back to make them even better. 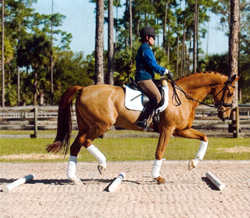 The cavalletti exercises will also teach you the difference between allowing a lengthening and forcing it. When you ask for a lengthening and then allow your horse to do the job on his own, his hind legs will step under his center of gravity, creating more balance and impulsion. This also recycles the energy through his swinging back to the soft, healthy connection in the bridle. The result is bigger steps. In contrast, when you try to force the lengthening by pushing and or kicking him into rigid hands with every stride, his back will stiffen and his mouth will brace against you, his front legs will quicken and his hind legs will lose their balance and rhythm. 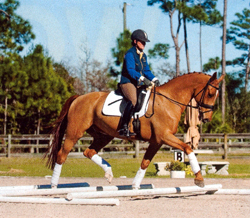 In these exercises, the cavalletti will do the work, encouraging your horse to take bigger steps so you can focus on the feeling of swinging back and the harmony in your connection. With my slow progression through the exercises, your recognition of this feeling and abilities to follow it with your seat and encourage it with your connection will improve gradually while, at the same time, his balance, strength and suppleness develop. 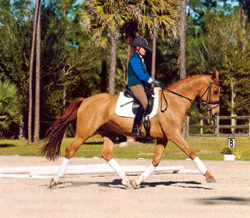 It may take weeks or even months before you notice any significant change in his stride length and suspension but, with this focus on relaxation and a solid, steady connection, you’ll be rewarded in time with consistent, reliable lengthenings. Trotting over cavaletti can build the engagement, power, suppleness and swing in your horse's back for beautiful lengthenings. As I mentioned last month, gaining your horse's trust is absolutely essential. He needs to know that you'll never ask him to produce more than he's capable of at any given time and that you’ll never punish him by pulling on the reins or bouncing in the saddle if he loses his balance temporarily. Give him time to understand what you want and build on your successes gradually. Make it fun for your horse too. Treat these exercises like a game rather than work. 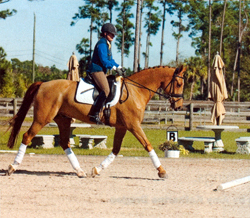 The more he enjoys the learning process, the more willingly he'll offer his best efforts at home and in the show ring. Tip: I prefer round jump poles or square ones with the corners filed off, so your horse won't hit any sharp edges if he kicks one accidentally. I also avoid lightweight plastic cavalletti, which can be knocked out of place too easily. Setup: All you'll need are five wooden jump poles and the help of a ground person. Make the poles as stationary as possible, either by placing them in cups made specifically for cavalletti or by mounding the footing around them. For your first session, place two parallel poles in the middle of the long side of your arena, about four feet from the track. Space them about three and a half of your boot lengths apart. (I use my own boot lengths, stepping on foot in front of the other, toe to heel rather than a measuring tape. This way you always have a consistent, reliable measuring method, wherever you are.) Your ground person can help evaluate the distances and adjust the poles as necessary. If you don't have a ground person, have a mounting block handy, as you may need to dismount a few times to fine tune the distances. Ride the exercise at the walk: Begin the session with your regular warm up. Then return to a working walk. When your horse is nicely between your aids, moving forward from your legs into a soft, round, steady contact, ride across the short side of the arena and take the inside turn toward the poles. Aim for the center of the poles, being prepared to close your legs if he hesitates or drifts to the right or left. Keep you tall upper body centered over your hips and hells. Otherwise, follow his mouth with soft, supple hands and sit as quietly as possible, allowing him to negotiate the poles on his own. As he goes over the poles, focus your eyes on the end of the arena. Going forward usually cures any minor drifting issues. 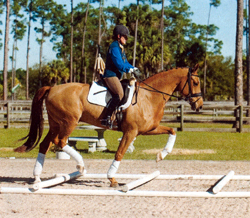 If your horse spooks significantly right or left before or over the poles, nudge him back on track with leg yielding aids. (so if he drifts to the left, close your left leg on his side, asking him to move back toward the center of the poles, while maintaining steady contact in both reins to keep him straight in his body.) After the poles, continue walking n a straight line all the way to the far side. Then turn onto the short side in the same direction you've been traveling and follow the rail around to repeat the exercise. 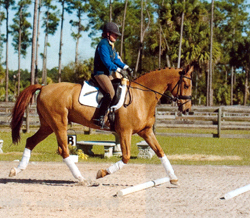 When your horse is comfortably and smoothly walking over the cavalletti in this direction, change rein across the diagonal or with a loop somewhere else in the ring, then ride over the poles several times in the other direction. 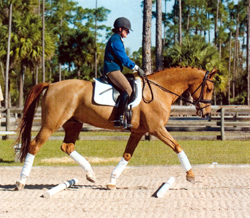 Ride the exercise at the trot: Once your horse is handling this easily pick up a normal, working trot rising. Check that he's round and listening to your aids before riding across the short side and taking the inside track to the poles. 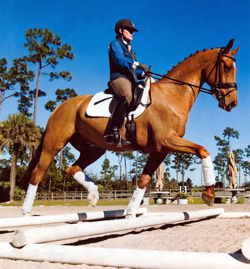 Approach the poles as you did in the walk, aiming for the center and riding positively forward, without asking your horse to change his natural stride length. As he goes over the poles, focus your eyes on the end of the arena and be as quiet as you can in the saddle, letting him do the work. Concentrate on your own balance and position: tall upper body centered over your hips and heels. Allow your hips to be especially loose, so they can accommodate any extra swing in his stride. If you need a little more support, press your knees into the knee blocks of the saddle. This will allow you to stay free and relaxed in your hips without resorting to your hands for balance. Most importantly, keep your fists and arms supple, following your horse's mouth forward and never gripping or pulling back, even if he suddenly accelerates and or leans on the reins. Each time you trot over the poles, tune in to what your horse is doing. How does his back feel? How does the motion change? Without pushing with your seat or legs, concentrate on allowing him to do the work. Feel his hind legs pushing over the poles and welcome his forward energy in your soft, following hands. If you notice him shortening or lengthening his stride to accommodate the spacing between the poles, ask your ground person to adjust the distance accordingly, making it match his natural stride length. At this point, you want to teach him how to relax and gain confidence over the poles in his normal working trot, without making any extra effort to adjust for the distance. 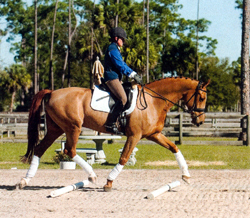 If the connection begins to deteriorate for instance, if your leg aids become lackluster, make the correction elsewhere in the arena, not immediately before, during or after the cavalletti. For example, if he barges against the bit over the poles, try not to react by bracing in your hands. Instead, wait to practice several half halts and transitions n a circle at the far end of the arena or along the opposite long side. That way, when you return to the exercise in a harmonious, agreeable manner, he won't worry that you'll complicate it while he's focusing on the poles. The goal is always to make the experience easy and enjoyable, so he stays relaxed and supple in his back. Space the cavalletti about three and a half of your boot lengths apart. Ask a ground person to help evaluate the distance as you ride over the poles and adjust them if necessary. 1. After walking over two cavalletti, I pick up a steady, forward posting trot. Ruudi, a 10 year old Dutch Warmblood owned by Ingrid Wallin, is round and listening to my aids. Approaching the poles, I aim for the center and ride positively forward. My upper body is tall and centered over my hips and heels. 2. As Ruudi goes over the first pole, I post quietly and fluidly, allowing my hips to be loose to accommodate any extra swing in his stride. I am following his mouth with soft, supple hands. 3. I've allowed Ruudi to negotiate the poles on his own and now, starting over the second cavalletti, he is relaxing and stretching over his top-line while still lifting his legs energetically. My tall upper body is balance and center over my hips and heels, and I have a soft, following contact with his mouth. 4. 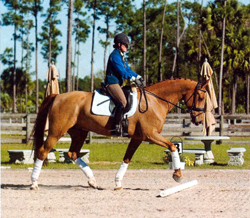 I feel Ruudi's hind leg pushing over the second pole and am accepting his forward energy into my soft, following hand. I never want to punish him by gripping or pulling back. I'll repeat this same program two or three times a week until it feels extremely easy. Tip: If you notice him shortening or lengthening his stride to accommodate the spacing between the poles, ask your ground person to adjust the distance accordingly, making it match his natural stride length. After several weeks, add a third pole to the exercise, spaced the same distance away from the second pole. This time, begin the exercise at the trot, rather than at the walk. The distances are set for trotting and three poles can be too difficult for a horse to mange comfortable at the walk. Again, approach the poles in a steady, forward, working trot, posing fluidly with the motion; otherwise stay as quiet in the saddle as possible. If he missteps or loses his balance, try to be forgiving with your aids and body weight, following his mouth with soft arms and opening your hips as much as necessary to accommodate any exaggerated steps. In response to any mistakes, always ride forward, using brief, gentle half halts rather than increasing the overall pressure in the reins. The more he trusts you not to punish his mistakes, the more he'll relax in his back over the poles. Practice these three poles a few times in each direction no more than three times a week for another several weeks. When he feels confident over three poles, add a fourth pole. Depending on how secure you feel, you may progress from posting to sitting over the poles. 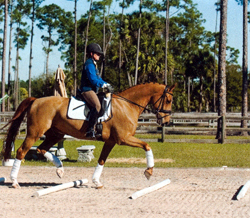 Focus n swinging your hips in motion with your horse's movements, always following and never pushing. If you notice any signs of tension in him, still back, raised head, go back to posting trot. 1. After several weeks riding over two cavalletti, I add a third pole to the exercise and then a fourth. I approach the poles in a steady forward working trot, posting fluidly with his motion. 2. Again, I focus on staying as quiet in the saddle as possible, staying loose in my hips to accommodate his extra lift and following his mouth with soft arms. I am keeping him between my legs, seat and reins, letting him do the work in a relaxed and balanced way. 3. Ruudi is really lifting his left hind leg over the pole, which will help him build the strength for more powerful lengthenings. If he made a mistake, though, I'd correct him by riding forward and use brief, gentle half halts. The more he trusts me not to punish his mistakes, the more he'll relax in his back over the poles. 4. After Ruudi has been comfortably trotting over the four pole exercise for a few weeks, I start adding a half a boot length between the for trot poles to ask him to stretch for a little more length. After your horse has been trotting happily over the four pole exercise for several weeks, you are ready to ask for a little more length. Patience is even more important at this point, as each new incremental challenge increase the demand on your horse significantly. So take your time! 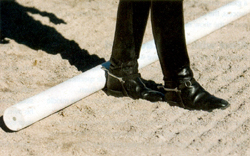 Start by adding half a boot length to each of the spaces between the four trot poles. Approach them in the same manner as before. If you've done your homework, this should still feel fairly easy for your horse. If it's not, shorten the distances by a few inches. Practice this for several weeks before lengthening the distances again. Never lengthen by more than half a boot length at a time and don't lengthen the overall distance by a total of more than one and a half booth lengths beyond your horse's natural stride. To help your horse produce the added balance and power necessary to tackle the longer distance, prepare him with two or three half halts just after you turn off the short side. Then ride forward to the poles, trying to be quiet and supple, rather than strong, in your position and aids. As he steps over the poles, concentrate on keeping him between your legs, seat and reins, without pulling on or pushing him. Remember to let him so the work. If you've followed the program to this pint as gradually as I've recommended, you may not feel as if your horse is making significant progress. On the contrary, he's working hard every time he lifts his feet over the poles. So long as he's staying balance and relaxed, he's building just eh muscles he needs for great lengthenings. 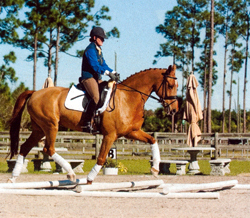 Once your horse is easily negotiating the poles spaced one and a half boot lengths farther apart than his normal trot stride, shorten the spaces back to the original distance and remove one pole, so only three remain. Place the two extra poles perpendicular to these poles, one on either side, then roll them just underneath the ends of the three poles so they're lifted a few inches off the ground (see photos). Use the same half halts out of the turn and forward approach to these raised poles. 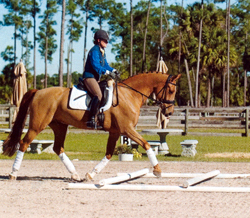 Focus on the feeling the raised poles create in your horse's motion without any extra push on your part. If he struggles to get over them or loses his balance, rhythm or relaxation, instead of trying to “help” by kicking or pushing him, shorten the distances by a few inches. When he's comfortable again, practice the routine for an additional week or so before returning to the original distance. There's no need to lengthen the distances farther than that; the raised poles are enough challenge on their own. 1. I placed tow extra poles perpendicular to three cavalletti and rolled them just underneath the ends of the three poles, so they're lifted a few inches off the ground. After half halting out of the turn, I approached these raised poles in a forward working trot. 2. Ruudi is really stepping over these poles with his front and hind legs without any extra push on my part. He has a great uphill balance, and the softness in my reins show he's in true self carriage. 3. 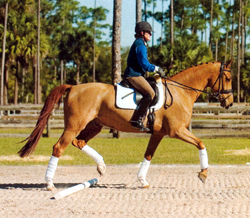 This cavalletti work builds strength and resilience in Ruudi's hind end, helping him produce better lengthenings. 4. Ruudi is really raising his left hind leg over the second cavalletti, yet he is relaxed. I'm following his mouth with a soft, supple contact and remaining quiet to let him learn the impulsion and thoroughness to go over the cavalletti. That's the goal of these exercises. Over time, these exercises will build strength and resilience in your horse's hind legs and more sewing in his back. In the meantime, continue working on your regular lengthening as well at other points during your rides. 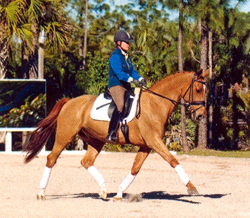 From a working trot, gradually increase you leg pressure to ask for more energy, which will produce longer steps. Concentrate on your own balance, stretching you legs long and your upper body back and tall and keeping your center of gravity balance over the middle of the saddle. Accommodate his bigger steps by swinging your seat with the motion. Soften your fists and wrists, thinking of following his mouth forward, without throwing away the reins. Instead of striving for brilliance in these (leave that to the cavalletti exercises to produce) solidify your horse's understanding of your aids. Ask him to respond promptly to your initial leg aids, and then leave him alone to do the work, while maintaining soft connections with your legs, seat and hands. From the beginning, accept whatever lengthening he offers and make that your baseline. When that becomes absolutely effortless, ask for just a tiny bit more. Take your time and remember to forgive his mistakes. Your patience will be rewarded tenfold! 1. I continue working on regular lengthening during my rides. Across the diagonal, I gradually increase my leg pressure to ask Ruudi for more energy form behind. That transmits through his relaxed back and neck into my soft contact, then back through his body to his hind legs. 2. As Ruudi takes bigger steps, I concentrate on my own balance, stretching my legs long and my upper body back and tall. My center of gravity is over the middle of the saddle and I'm swinging with my seat. I've softened my fists to follow his mouth forward.